Defying the tyranny of the signature dish can be risky, but sometimes it reveals a restaurant's hidden talents. Dining out involves grappling with countless variables before you even order. Is your reservation at a civilized hour? Do you have a desirable table next to attractive patrons who aren’t talking about finance or constantly photographing their food? Are you located in what you consider to be a prime location of the restaurant, preferably in view of the main entrance (but not so close that you get a chill, mind)? Then the menu arrives, with its list of small plates, and a hovering waiter eager to explain it. This is all unwelcome, of course, but there is one thing everybody wants to know: What is the chef’s signature dish? You probably know this ahead of time. The Times and New York magazine and the rest of the reviews conveniently put it in a box, with equally pressing information like the address, phone number, and whether or not they take American Express. Every so often, there is one item on a menu that’s so out of place that it catches your eye: What is that doing there? Some restaurants signal an important dish by adorning it with hard-to-miss graphic flourishes. On Rotisserie Georgette’s lunch menu, the highly recommended poulet frites is surrounded by a tall ellipsis. 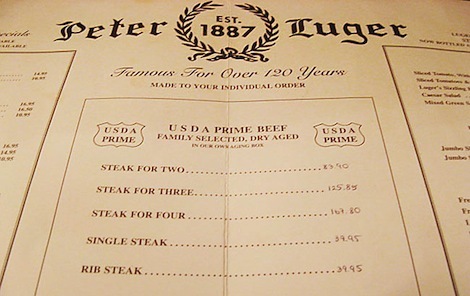 At Peter Luger, if you even bother to look at a menu, you’ll find a large box that says Steak for Two, Steak for Three, and so on. Traditionally, most menus have had their own internal logic—you progress from light to heavy, from fish to fowl and on to beef. There are rarely surprises. But every so often, there is one item on a menu that’s so out of place that it catches your eye: What is that doing there? It’s either a woeful miscalculation or something so incongruous it must be truly inspired. Not the three-pound lobster at a steak restaurant, or a token gluten-free choice. No, this is a dish with some thought behind it, but one that still seems out of place. Like a comic actor playing Hamlet, it’s either a poor gimmick or truly visionary. Think of it as ordering Siberia. This thought occurred to me when numerous friends mentioned that the burger at Lure, the Soho seafood restaurant, was surprisingly good. 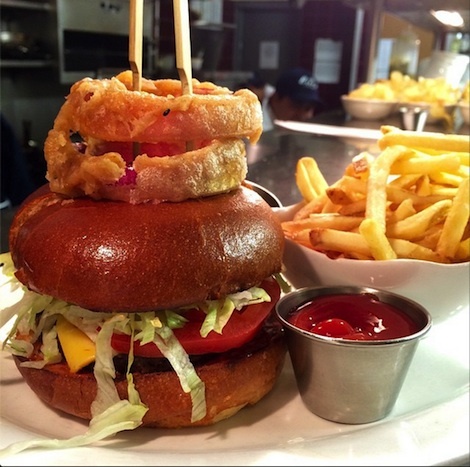 If you go to a restaurant that serves sushi, chances are you’re not going to progress to the burger. But like those people who go to a concert to see the opening act, there is a knowing circle of aficionados that goes to Lure just for the beef. The dish that’s always surprised me most is the duck at Le Bernardin. The only meat on a menu entirely devoted to seafood, it’s under the mercurial menu category “Upon Request,” as if it should be ordered in a whisper. Just what happens when you make this request? Does the waiter raise an eyebrow? Are you discretely escorted from the dining room? Does Eric Ripert come out of the kitchen and explain the premise of the entire restaurant? So I went to Le Bernardin with the perverse intention of not even ordering fish. This struck me as downright devious—in the four-star dining sense, as incongruous as buying a painting by Bob Dylan. The no-fish plan was quickly dashed when the kitchen brought out its wonderful salmon rillette to start. Then I enjoyed a finely sliced artichoke with a light vegetable risotto in lemon broth. Delightful. One of the conditions of ordering Siberia is that you don’t know what you’re getting into—it’s necessarily unexpected.. The main course was crispy duck breast, slightly salted, quite rare, garnished with snow peas and finished with a sour cherry sauce. Was it good? Of course it was good; everything at Le Bernardin is beautifully executed. I drank red wine. I’ve never had red wine at Le Bernardin before. Then I thought a moment. Eric Ripert, and his chefs, are clearly inspired by fish—that’s what drives them, what animates their cooking. That’s what they dream about, why the restaurant exists, and, ultimately, why it excels. My meal was lovely, but it wasn’t transporting in the way other meals I’ve had there were. Le Bernardin makes it seem like they’ve invented every fish they serve—each preparation feels like the first time you’re truly tasting something. This duck experience felt more earthbound. And the fault was certainly not theirs—I ordered the meal. They didn’t misrepresent themselves; I did that myself. It doesn’t have to be that way. At Le Grand Vefour, the two-star Michelin restaurant on the Palais Royal in Paris, the historic room is remarkably elegant. Colette ate there, as did Fragonard. There’s a dish that neither would recognize at the bottom of chef Guy Martin’s otherwise reassuring menu: The last of the desserts is an artichoke tart. It’s a compelling suggestion. 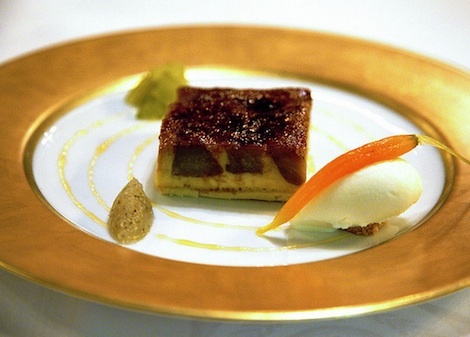 It turns out to be neither sweet nor savory, a thin layer of crème brulee combined with artichokes, and covered with candied vegetables. It’s masterful. One of the conditions of ordering Siberia is that you don’t know what you’re getting into—it’s necessarily unexpected. There’s a backstory you’re eager to learn, like when a mysterious guest shows up at a party. The Monte Carlo, in my hometown Minneapolis, serves steak, chops, and fried chicken in a classic midcentury room. They also offer beef liver. I asked once what that was doing there, and the owner said he tried to take it off the menu, but a small, vocal minority came in to order just that, and they would be damned if it was going to go away. One suspects that’s what chicken hash is still doing at the ’21’ Club—that it got grandfathered in, and that there are devotees who insisted on its presence. And that’s the beauty of ordering Siberia. It’s a reminder that traditions can’t be predicted, and that every unexpected dish was new once, hoping to become a standby with its own devoted following.